Gabrielle Union was spotted at the Miu Miu Fashion Show for Paris Fashion Week. She looked absolutely classic in her dress and heels. I love the way she made her look pop with her pink Miu Miu clutch. 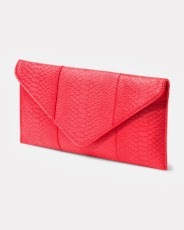 Just the other day I saw a similar style clutch from TJ Maxx. Be bold and make your look stand out like Gabrielle.